Click on Hosting Settings next to the domain you are configuring. Check the box for Custom error documents. You will be taken back to the Websites & Domains tab and it should say "Information: The settings were successfully updated" near the top of the page. Once you have Custom Error Pages turned on, you have three options for setting them up: edit the existing error documents, or create new ones. Within the Root directory, click the error_docs folder (the text link or the folder in front of the link). Click on the error page you want to edit. For example, Not_Found.html. Once saved, your changes will take effect. No additional steps necessary. Instead of editing the existing error pages, you can create your own with different filenames, or even specify that it redirects to a specific URL instead. Click on Show Advanced Options (grey link near the middle of the page) if the advanced options are not already shown. Location: Input the file name or URL, depending which type you selected. If the custom error document is located in a directory other than error_docs, the path should be relative to the virtual host root (i.e. <vhosts>\<domain>\httpdocs). Click on the Files tab and open httpdocs (or the document root for the domain you are configuring). 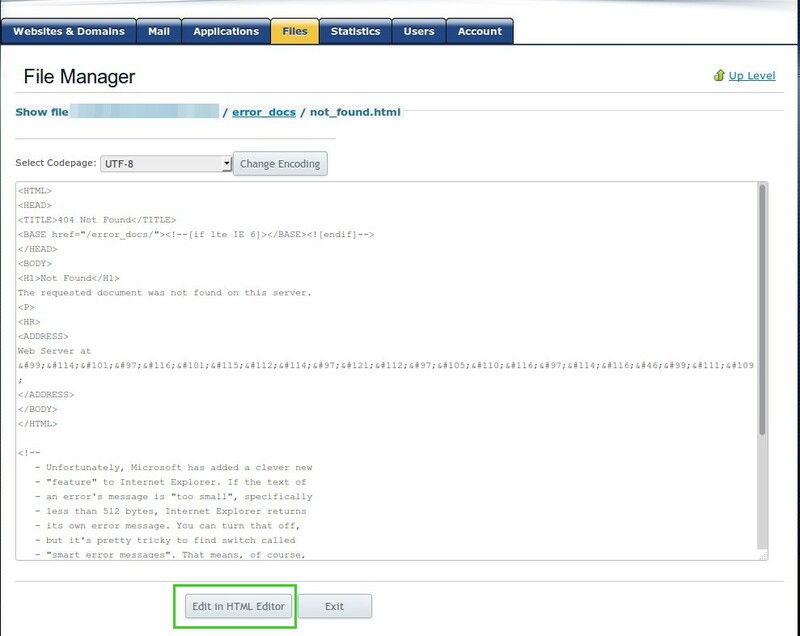 Click on the web.config file to open it in the Plesk text editor. Custom error documents can be added in the httpErrors section. The first step would be to add code that removes the preset error document. Replace the number for the statusCode with the error code you wish to replace. After the preset error documents have been removed, the new error page can be added. For the path, use the relative path to the error file from your document root. For example: "/error_docs/NothingHere.html"
The step above can be repeated for each error status code you would like a custom error page for.